Are you into WWE – World Wrestling Entertainment? Who’s your favorite wrestler – the one you’ve been admiring his strength, moves, power, skills or styles? We are happy to inform you that WWE Mayhem for PC provides you with an opportunity to take the role of your WWE idol in the ring. The game also lets you interact with other WWE stars and bear the brunt of their anger. In this page, we provide you with an easy-to-understand tutorial on how to download and install WWE Mayhem for PC on your Windows 7/8/8.1/10/XP or MAC desktop/laptop. 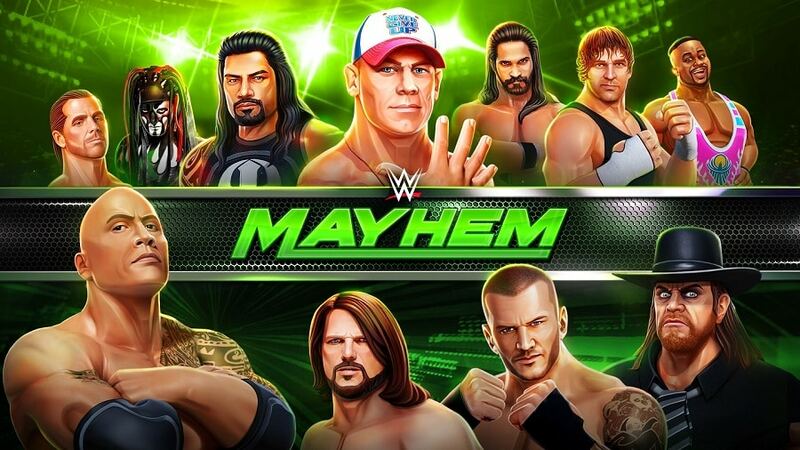 WWE Mayhem is a super fun wrestling game developed by “Reliance Big Entertainment (UK) Private Limited”. The game lets you take the role of WWE rock stars in the ring – John Cena, AJ Styles, Brock Lesnar, Steve Austin, Stone Cold, Triple H, The Rock, Shawn Michaels and other wrestlers you’ve seen for the past few years. All these wrestlers have a real-life graphic appearance as well as unique skills and styles. To emerge victorious in every match, you’ll have to use your wrestler’s moves appropriately. You are free to learn their moves & skills, as well as how to combine them to form continuous combos, either in the training mode or by checking them out in real-time matches. Once you master the art of smashing your opponents, no one will be able to stop you from becoming the WWE world champion. The developer has created an excellent appeal for gaming geeks, thanks to the stunning graphics. You’ll love their fun styling design and how they have simplified the details and kept the characteristics of each wrestler in the game. 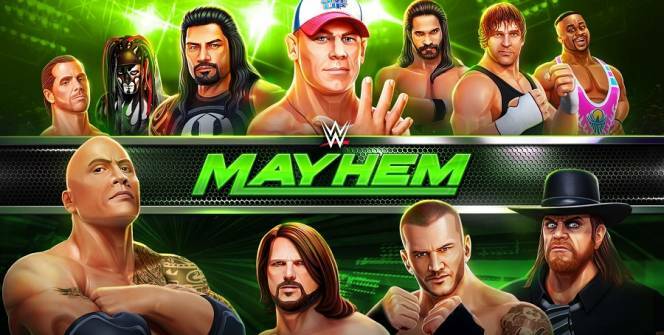 Overall, WWE Mayhem offers fantastic graphics that makes it worth playing on a bigger screen. You’ll be able to control your character(s) just by touching and swiping your screen. This means that you’ll only need to perform simple actions in order to defend, attack, and execute excellent skills. Click the right side of your screen to attack. Swipe right for a strong attack. Swipe right & hold to perform a skill. Click on the left of the screen to defend. At the bottom of your screen, you’ll be able to see a power bar. When you attack, you’ll make the energy bar get filled. At that point, you can use the special skills of your wrestler to finish off the opponent. 3. Join Forces with Champions & Unleash Mayhem. The game offers Random Championship Matches & Tag Team Matches like Clash of Champions PPV, Monday Night RAW, as well as some monthly title events. You are free to form a tag team and show off your ability in the team matches. 4. Choose Your Wrestlers Based on His Ability. Whether your favorite wrestlers are WWE Superstars or WWE Legends, you’ll be able to add them to your team with ease. This is because the star wrestlers are classified into 6- different classes- Showman, Wildcard, Technician, Powerhouse, High Flyer and Brawler. Note that they are categorized based on their wrestling skills and track records. The game features tons of events where you’ll have the opportunity to win exciting rewards & bonuses. You can also open your “Loot Cases” to unlock a lot of stuff, including prizes, gold, characters, spinning tickets, support drinks, etc. Moreover, if you are good enough, you can win the ultimate prize- WWE Championship title. Play With Friends: WWE Mayhem for PC brings you friends in the form of competitors since you can play with your friends in real time. Realistic Gameplay: You’ll enjoy realistic-WWE events like SmackDown, weekly WWE RAW, and other such live challenges. WWE Mayhem is Free: The game is free to download, install & play on Android & iOS devices as well as on Mac and Windows desktops/laptops. If you are a true fan of WWE, then playing WWE Mayhem on your Android or iOS device might not give you the experience that you’re looking for. We recommend that you download and install it on your computer. The high-flying, in-ring, arcade action game runs smoothly on Windows 10, Windows 8.1, Windows 8, Windows 7 and Windows XP desktops and laptops. Sometimes when playing WWE Mayhem, bluestacks ask you fee to pay but gives you option to download some apps. Every time it asks you just select “Install apps” and continue using it free. I hope you enjoyed this article, please rate and share. If you have problems running WWE Mayhem on your desktop or any other issues, leave a comment below.